Bulk SMS allows you to upload and send a large number of messages in one go. You can pull the data from your live CRM system or other databases and perform a send without needing to store the details in your contacts first. 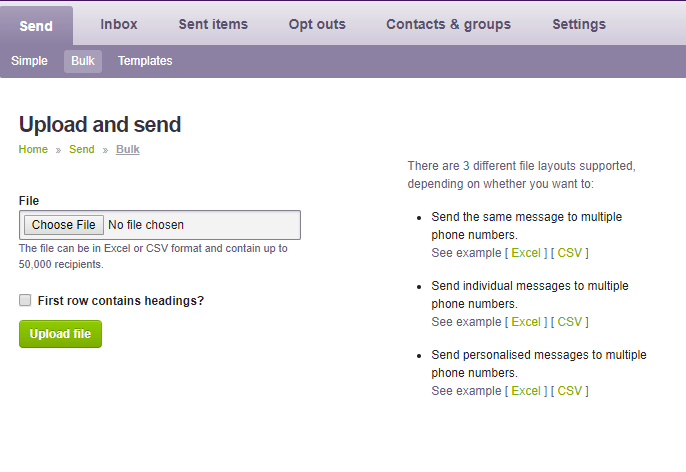 Personalised messages to multiple phone numbers – 3 or more columns of data. To ensure a successful upload please use one worksheet per file and check that the numbers are not stored as text before uploading. Also, when adding your numbers to the spreadsheet, please ensure they’re without spaces, hyphens, commas or other punctuation or letters. If you do have these, you can use the ‘Find and Replace’ options in your spreadsheet to remove them. You can enter numbers either in international format or local format; most spreadsheets will remove the leading zero, but Echo recognises this and adjusts. Click the ‘Choose File’ option, select the required file, and indicate if the first row contains a header or not by using the tick box. Finalise this by clicking the green ‘Upload file’ button. The following screen will depend on the type of file layout you have uploaded, but it will allow you to preview your data and choose your message.